As a mom, I know how much we care about our children. We want to make sure our children are thriving and growing by providing them with a healthy environment and making sure they are nurtured. With our children growing as quickly as children do, it is important that their developing bodies get the essential nutrition they need to have healthy brain function, abundant energy (sometimes I know we wish they would just sit quietly but energy is a good sign), a responsive immune system and strong bones and teeth. Catch today’s weekly chat about building good children’s health! The key to raising healthy children is to make sure they develop healthy eating and exercise habits at an early age. By starting now, you are actually laying a foundation that can help prevent illness and disease later in life. Conditions related to nutrition, weight, and lifestyle such as osteoarthritis, cancer, diabetes, heart disease and hypertension can all begin during childhood if a healthy diet and active lifestyle are not provided. While we all like to think that we can provide a complete and nutritiously rounded diet to our children every day and that they actually eat it, the reality is, most children and adults are not getting the complete nutrition they need. Could your children benefit from a multivitamin? The answer is yes if you find any of the below to be true. The sale of vitamins and minerals for kids is growing. More children are taking a multivitamin than ever before. While many children are taking supplements, it is important to know exactly what is in what you give your children. There are a lot of dangerous products on the market that are not what they say they are or are full of artificial fillers, preservatives, flavorings and coloring that can actually make your child sick. Yikes! Vitamin B is essential for a healthy functioning brain and nervous system and helps convert food into energy. It helps form protective antibodies and healthy red blood cells that are depleted in our body by the consumption of sugar or stress. For this reason, Vitamin B can help with depression and anxiety. Adequate amounts can help prevent birth defects in expecting moms, prevent cervical dysplasia, colon cancer, fatigue, hair loss, and anemia. Taste. If it doesn’t taste good than it is unlikely you will get your child to take their vitamin each day. Just make sure to avoid artificial flavoring. There are many tasty and NATURAL ways to make things taste good. Avoid refined sugars or artificial sweeteners. These are often labeled as sucrose, fructose, sorbitol and artificial sweeteners. The better option is xylitol or stevia. 9 our of 10 children are sensitive to artificial coloring. This can result in learning and or behavioral issues. Most children are not getting enough omega-3 fatty acids. These are important as they play an important role in the growth and development of our brain, eyes, and nervous system. Many organizations, including the Institute of Medicine’s Food and Nutrition Board, the World Health Organization (WHO), the American Dietetics Association, and Dietitians of Canada, recommend increased consumption of omega-3 fatty acids in children. Many parents these days are nervous about providing fish to their children to frequently because of concerns about environmental contaminants in our fish supply. This is why supplementation with a high-quality dietary supplement that uses highly purified fish oil offers a means for safely providing DHA to our children without worrying about the mercury and other environmental toxins present in the fatty fish that provide the food source of DHA. After speaking with many moms on the topic of safe vitamins for your children, I have heard just how important quality and dependability are. As parents we want something we know will be safe, from a company that we can trust and has shown results. This is why, I can stand confidently behind my recommendation to use Shaklee’s children’s vitamins. The Shaklee children’s vitamins are some of the safest products available on the market. They are always safe, always green and always work. Their products are gluten free and contain no artificial flavors, sweeteners or added preservatives. The recyclable packaging is even safe and free of bisphenol-A, phthalates, and toxic inks. For Children 4-12 years of age, take 2 tablets daily. Shaklee Incredivites are your go-to multivitamin for children. They are formulated with an assortment of 23 essential vitamins and minerals. In each serving, your child is getting 100% of their Daily Value of all B vitamins as well as vitamins C and E, which are important in creating a strong immune system. With calcium and vitamin D, your little is getting the crucial bone-building nutrients they need to be strong. Like all Shaklee vitamins, there are no artificial sweeteners or preservatives. Incredivities are naturally sweetened with xylitol, which does not promote tooth decay. Doctors and dentists love this feature! Children 4 years of age and up, take one chew daily. Shaklee Might Smarts are your go to for safe omegas for your child. They are scientifically formulated with 100% natural, ultra-pure DHA, one of the most important omega-3 fatty acids in the brain and eyes. They are 75% organic and contain no added artificial flavors, colors, or preservatives. These tasty treats have no fishy taste but all the fishy goodness. 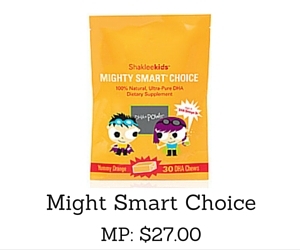 Kid-friendly, Shakleekids Mighty Smart Choice is scientifically formulated with 100% natural, ultra-pure DHA, one of the most important omega-3 fatty acids in the brain and eyes. They are 75% organic and contain no added artificial flavors, colors, or preservatives. Vita-Lea Ocean Wonders is a great-tasting, scientifically advanced and tooth friendly multivitamin & multi mineral formulated especially for children. Chewable and sugar-free, Ocean Wonders promotes the development of strong bones and teeth. Chewable and sugar-free. Available in all-natural tropical punch, grape & berry flavors. Have questions or are looking for specific nutrition for you and your family? Contact us and we will help guide you!